Ex-Easter Island Head bring their expansive ensemble to the Kazimier, Getintothis’ Harry Sumnall takes in a night of epic ambience. 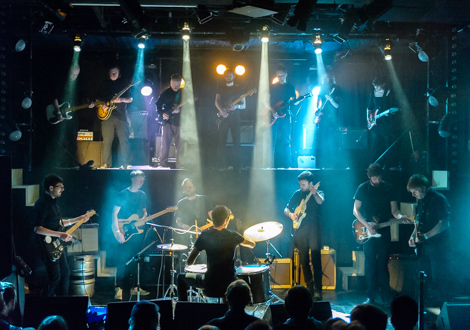 Fresh from their GIT Award nomination, Ex-Easter Island Head return to the Kazimier for the third 2014 performance of their Large Electric Ensemble – for 13 guitars and drums. 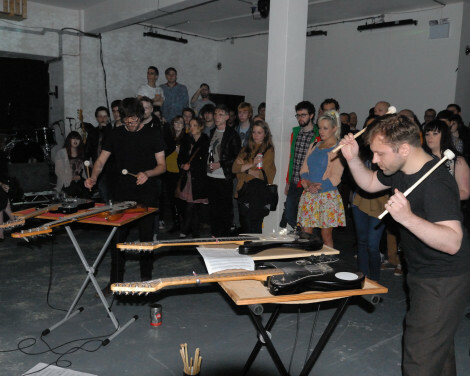 Originally commissioned for Nottingham’s World Event Young Artists festival in 2012, Arts Council funding has supported four additional performance dates, which will culminate at the end of May at Birmingham’s Supersonic Festival. 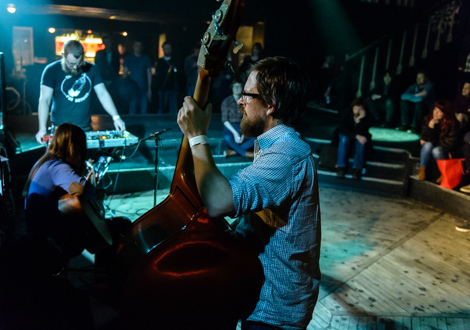 The Kazimier stage has been arranged to allow two banks of musicians. Ensemble leader Benjamin Duvall, drums, and five other guitars are on the bottom tier, six additional guitarists above. You can tell a lot about musicians by the make of instruments they choose, and here we have a diversity of designs, suggesting individual musicians with a wide variety of motivations for the evening. 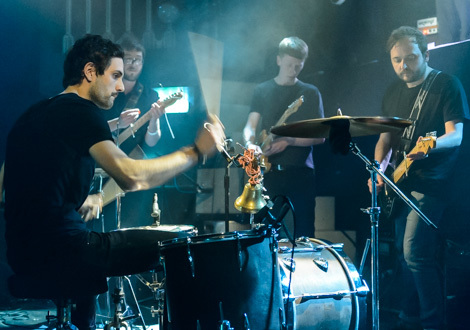 Movement one begins with a simple bell and tom pattern, and the guitarists are divided into two sections, the first playing a slow vibrant strumming pattern at the neck of the instrument, the others alternating with a rapid strike near to the bridge. The guitarists are initially stationary so it’s strangely hypnotic to watch their precisely coordinated arm movements. Each player appears to have a set series of sequences that they are following and whilst there is no deviation or improvisation, progression from one sequence to the next is indicated by the drummer. Initially, it’s not too musically different to the cosmic drone that labels such as Kranky have been releasing over the last 20 years, but rather than layers and layers of looped instruments and effects its the clever interplay of guitar tone and rhythm that adds interest. The second movement is more reflective and the musicians appear to be approaching the instruments with greater delicacy and consideration; carefully tapping guitar necks, and offering nimble fingertip strumming. While emanating from the same frequency range, ride cymbal washes, trickling resonance, and subtle variations in intensity build to an extraordinary fragile cacophony that sounds like a bright spring day in the Isles of the Blessed. It’s at this point that everything comes together, and the piece is truly magical. It’s a testament to the power and beauty of the music its slow fade out is not interrupted by any unwelcome audience noise. The third movement, our favourite, is more conventional; a repetitive drum groove tempered by a precisely locked 2 note guitar progression. Its here that the massed assembly really works, and we’re (erroneously) convinced that there are secret instruments playing behind the Kazimier stage adding sonorous bass tones and percussive colouration. The piece ends with a shift in tempo and sharp cymbal strike. Moving on to the fourth movement, there are two tonally distinct guitar motifs reminding me of Remko Scha‘s Machine Guitars, but the drums pick up the pace, laying a neat funky four-four beat that guides the players but is not afraid to introduce neat fills. 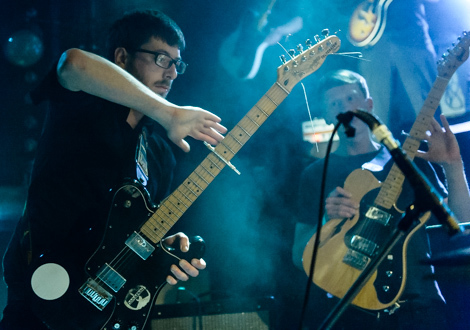 By now its clear the guitarists are really enjoying themselves, sequenced leg kicks, guitar solo faces, instruments held aloft, and even a Pete Townsend windmill – moves usually held in disdain, are forgiven. A relatively short piece, 30 minutes racing by, it doesn’t need histrionics or wailing feedback, just a final cymbal, snare and resonating chord, fading out gently for 30 seconds. It’s been truly captivating and the audience is genuinely delighted. There’s no encore of course, anything else would have been ruinous. Duvall, rightly pleased with the performance, offers a few words of embarrassed thanks. We quickly leave the venue, not wanting any idle chatter to interfere with the absorption of what was just heard. We’ve enjoyed the official recording of the piece, but the live performance tonight was something else, adding a richness and atmosphere that wasn’t otherwise captured. In a city where the experimental label is sometimes too easily applied to bands that are simply lacking in thought and refinement, its great to finally hear the real deal. Earlier, although trying our best to ignore Richard Dawson‘s quasi shambolic stand up routine, we’re soon intrigued. His most recent album hen ogled was a magnificent collaboration with harpist Rhodri Davies but tonight it’s just him and an acoustic guitar. An accomplished finger picker, its Dawson‘s simple North Eastern plainsong of industrial tales that stand out. 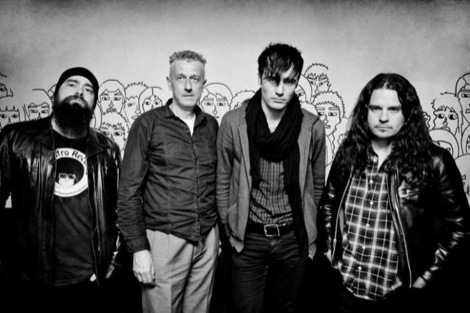 Opener Poor old horse, delivered in the Kazimier circle, is a fitting addition to the tradition of equine lament, providing a haunting evocation of Bresson’s Balthazar – the world in an hour and a half (tonight compressed to five and a half minutes). A Brisk Lad with it’s tale of a sheep rustling father suggesting all is not well on the Northumberland moors. 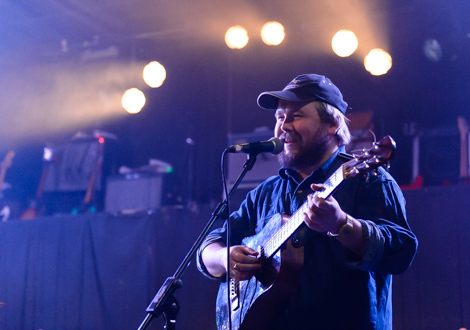 Dawson effortlessly captivates the audience and proves that in the right hands, sometimes all you need is a simple song and a gruff voice. In contrast, with audience members arriving for the show, opening act Trouble with Books struggled to hold our attention. Their quiet melancholy was almost apologetically delivered and lacked the experimental and celestial edge of more adventurous free folk contemporaries. 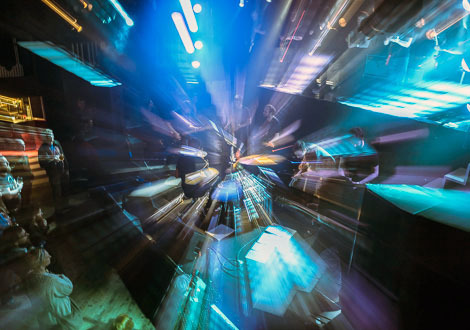 Having OD’d on countless freaky loop pedal drones over the years it requires more than a few feedback tricks to grab our attention but tonight the band didn’t seem to have much in reserve. Ex-Easter Island Head large ensemble were: Ben Duvall, Matthew Fleetwood, James Finlay, Dan Layton, Graham Langley, Neil Johnson, Mark Lowman, David Stockwell, Tim Lofihi, Katharine Eira Brown, Jon Hering, Gareth Hardwick and Chris Summerlin and Jacob Chabeaux (percussion).